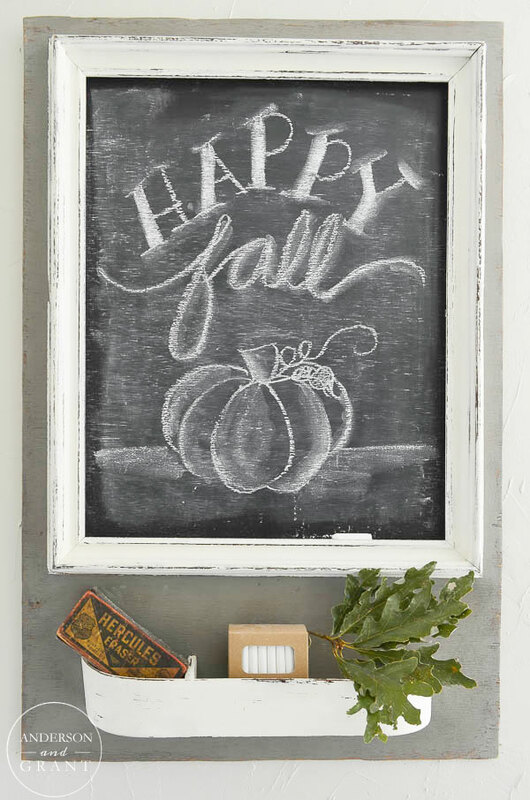 Happy first day of fall!!! 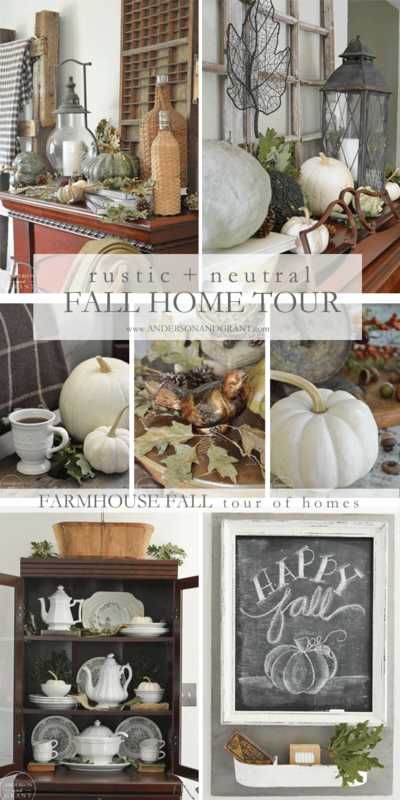 How lucky am I that the day of my fall home tour falls on the start of the season. 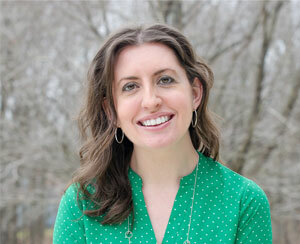 I'm so excited to share what I've put together with you today. 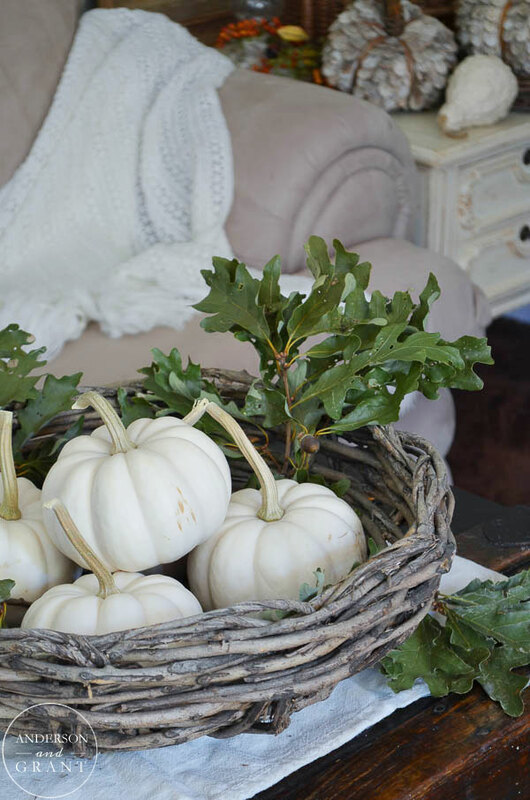 If you are a follower of a+g, then you've been seeing little glimpses of my fall decor already, but today is everything in one place, plus lots of things you haven't seen. 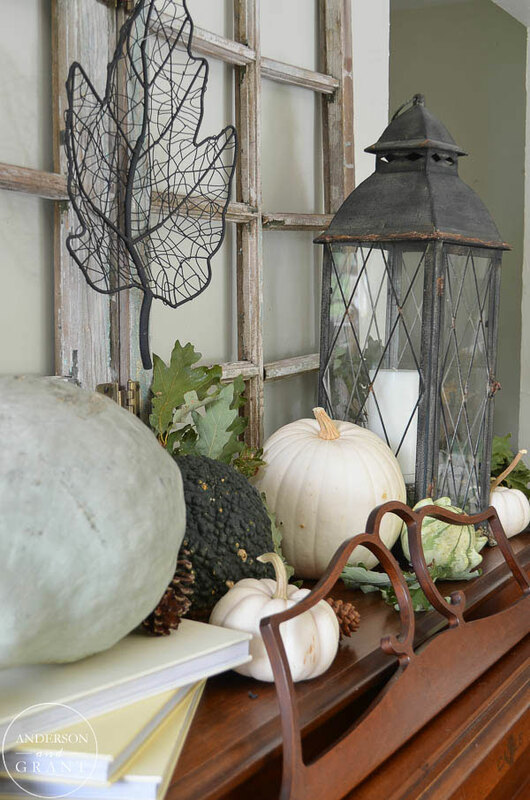 When you are done visiting my home, be sure to visit my friend's homes and see their amazing decor too as part of the Farmhouse Fall Tour of Homes, which started on Monday and runs through the end of the week. 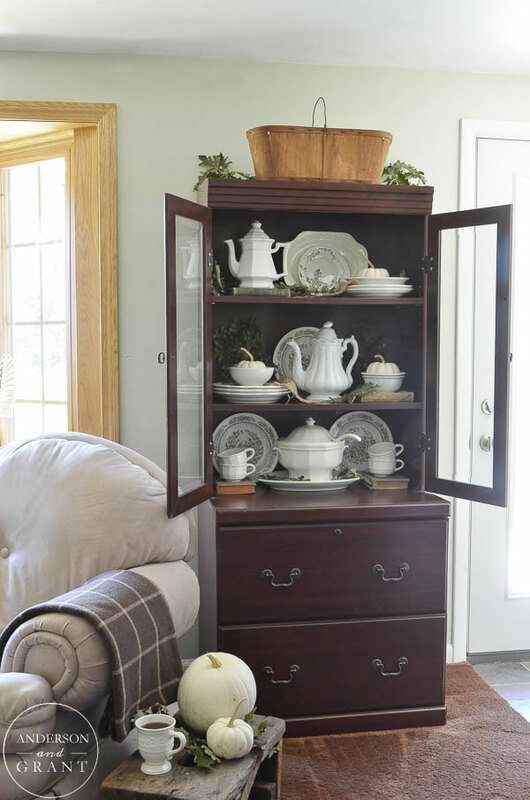 We all have very similar styles, so it is really inspiring to look at what each of these other 14 gals has put together in their own homes. Everyone's links appear at the end of this post. 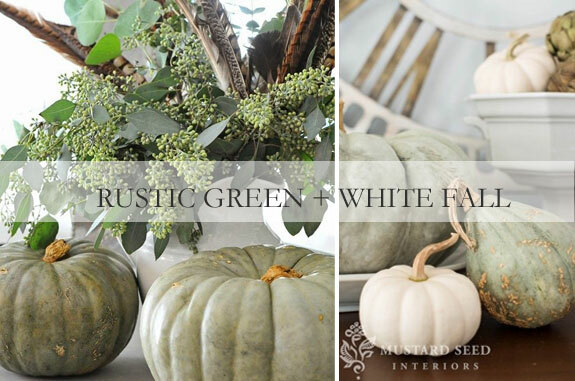 As I've mentioned before, this year I'm going neutral with shades of green and creams for my fall decor. 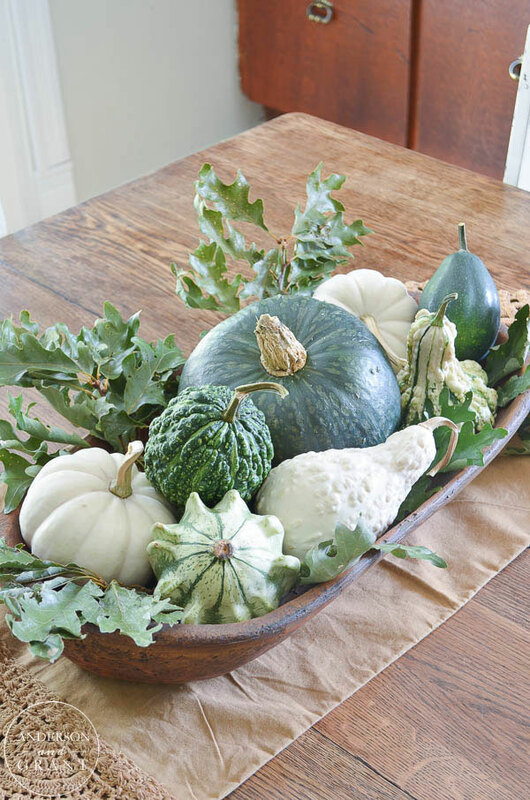 There also seems to be a lot of natural elements like pumpkins and squash, pine cones, and real leaves. The whole theme is incredibly calming to me. 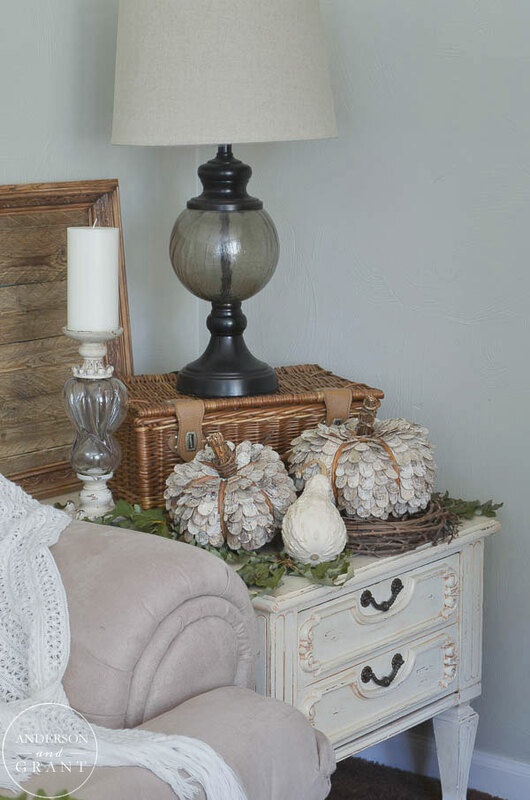 Clean and simple is my goal for this season and the easiest way to do that is to look to what is naturally in front of us for decorating. I'll try to keep my talking to a minimum today so that you can enjoy the tour. Sources appear underneath the room in which they appear. 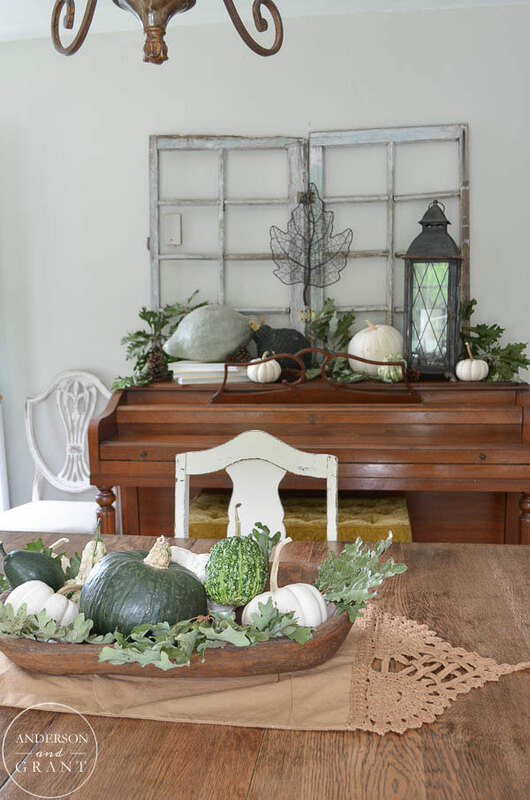 As you walk in to the house, the first thing you see is my dining room table with a simple centerpiece filled with gourds and pumpkins. 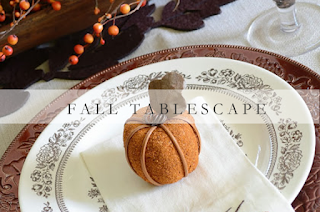 This is something that can stay on the table through the whole fall season. 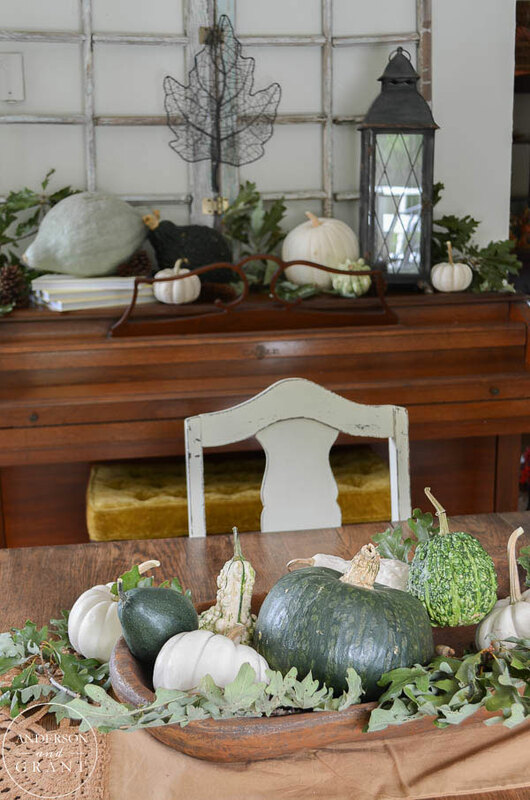 I've put together a pretty uncomplicated display on the piano in the room, too. 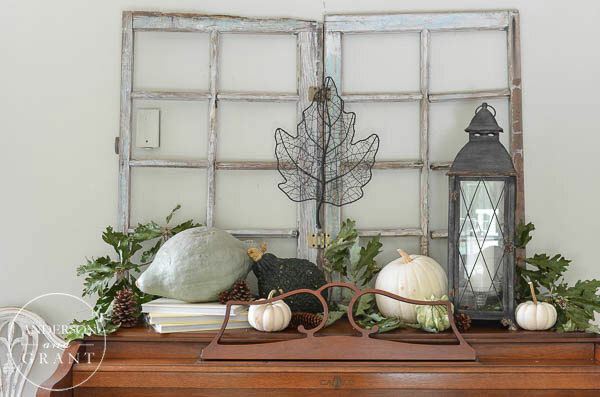 The backdrop is an old window frame that I've used in different places in the past. 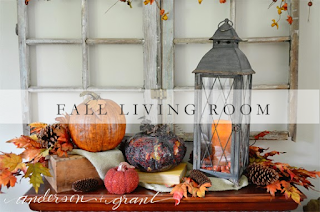 (You may have seen it hanging over my fireplace last fall.) Hanging on the window is a pretty metal leaf. 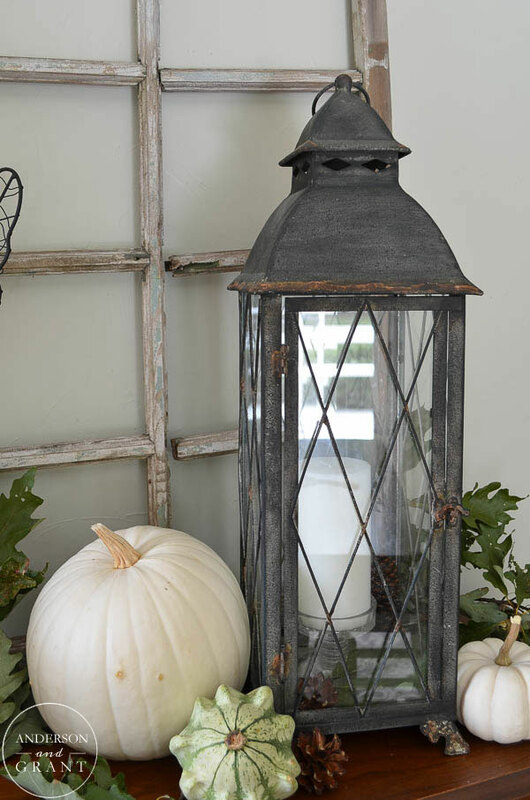 There are a collection of squash and pumpkins here, too, along with a tall lantern that I use all the time. 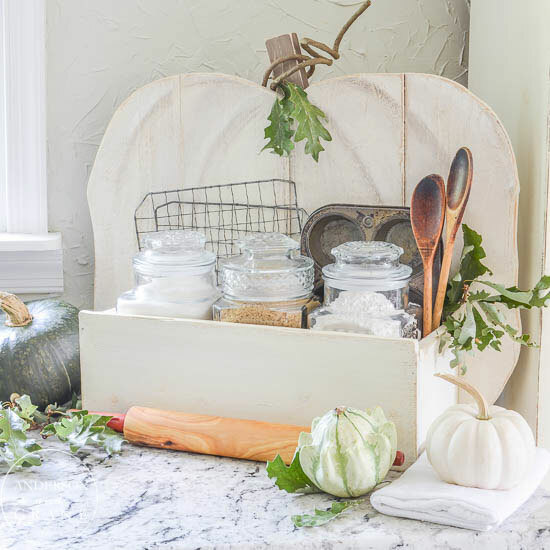 On the kitchen counter, I've included a basket filled with anything that I use all the time. 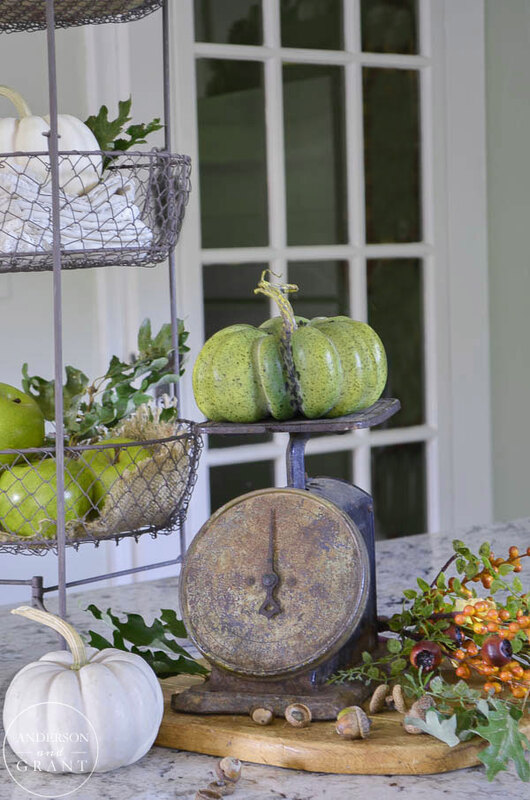 Cups, coasters, napkins, some fresh (green) apples.....and another pumpkin! 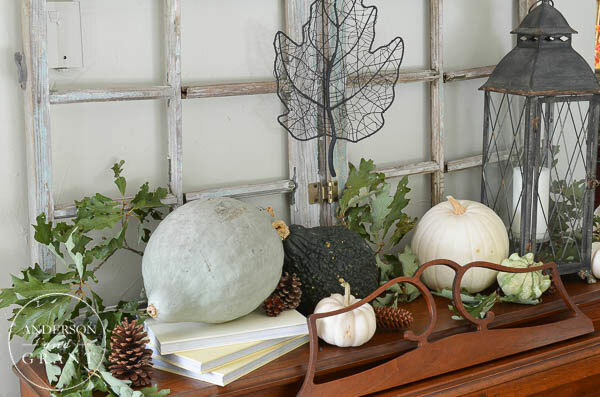 I'm loving the tiny green pumpkin that my mom bought for me a few weeks ago. 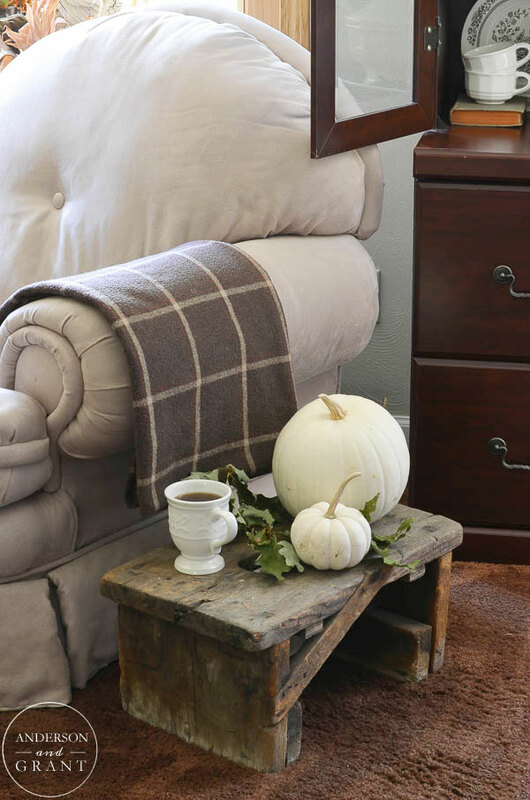 It fits perfectly into my decor plan! 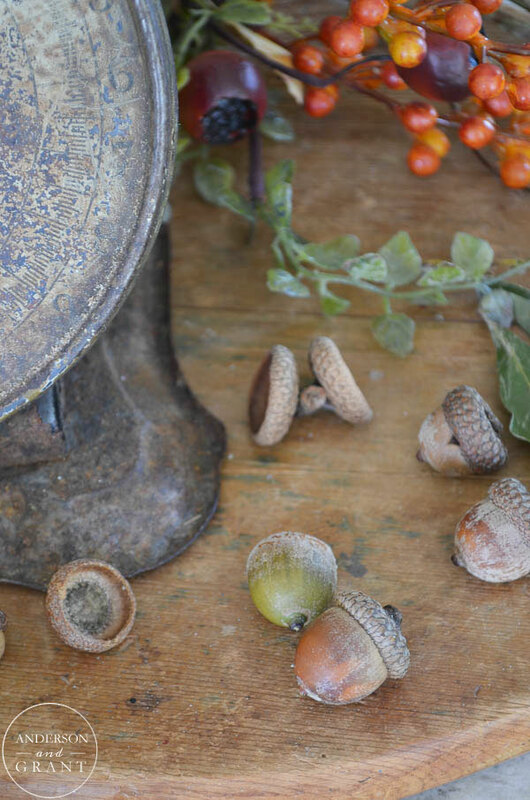 The acorns were collected from under my favorite neighborhood oak trees on a recent afternoon walk. 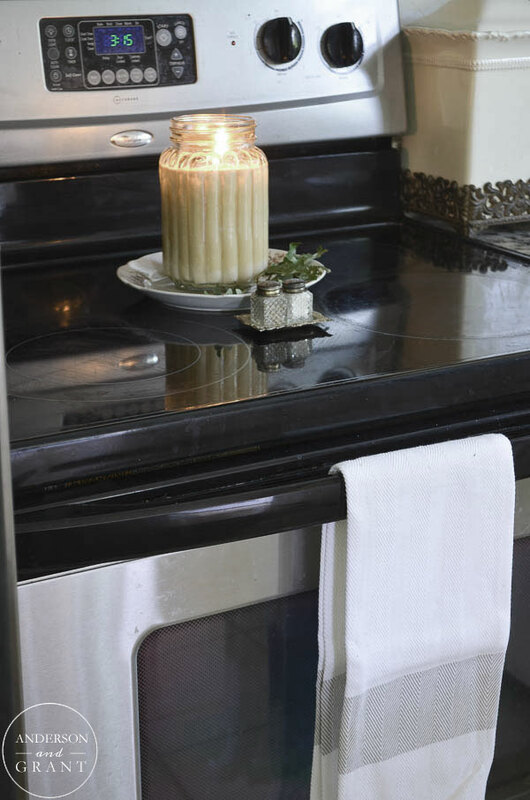 On the stove, my favorite scented candle is filling the house with the aroma of hazelnut. 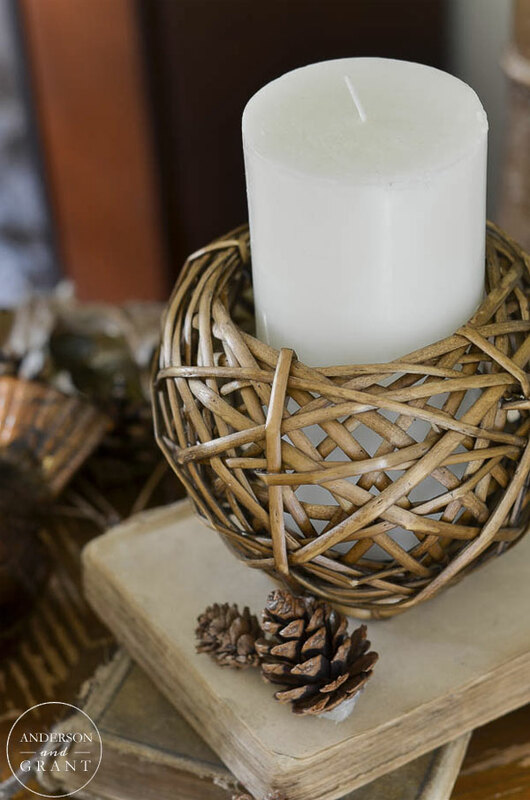 Swan Creek Soy candles are so fragrant that they don't even have to be burning to smell amazing. 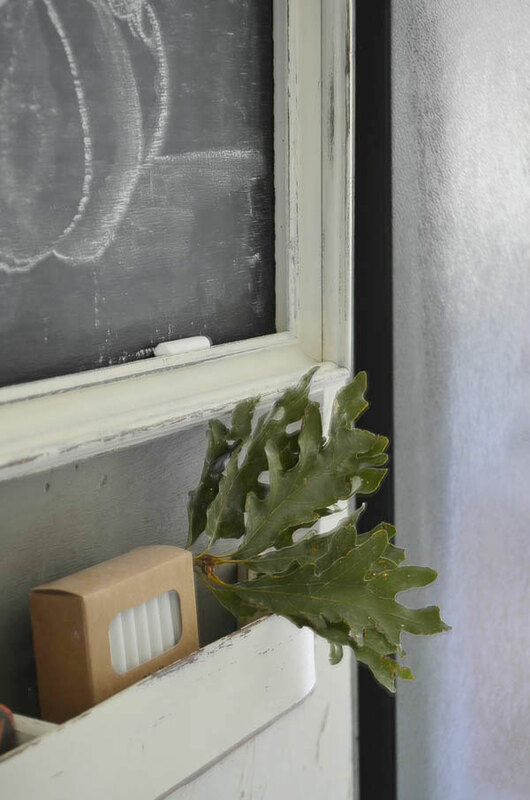 The top of the refrigerator is dressed simply. 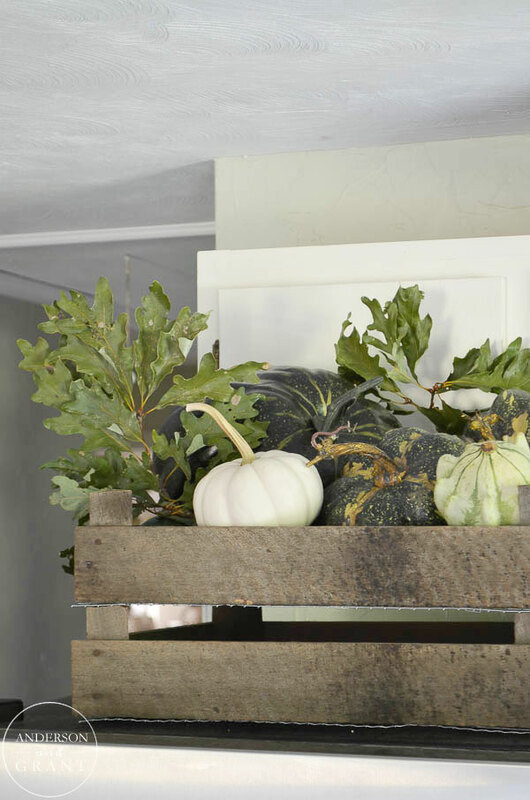 I stacked the two tulip crates that I created and filled the top one with pumpkins and gourds. 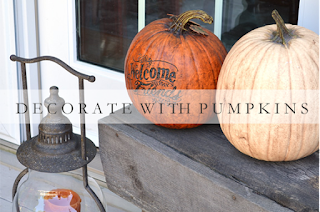 And you may have already seen my Rustic Pumpkin Stand from last week that I had the opportunity to create with Home Depot and 23 other bloggers. 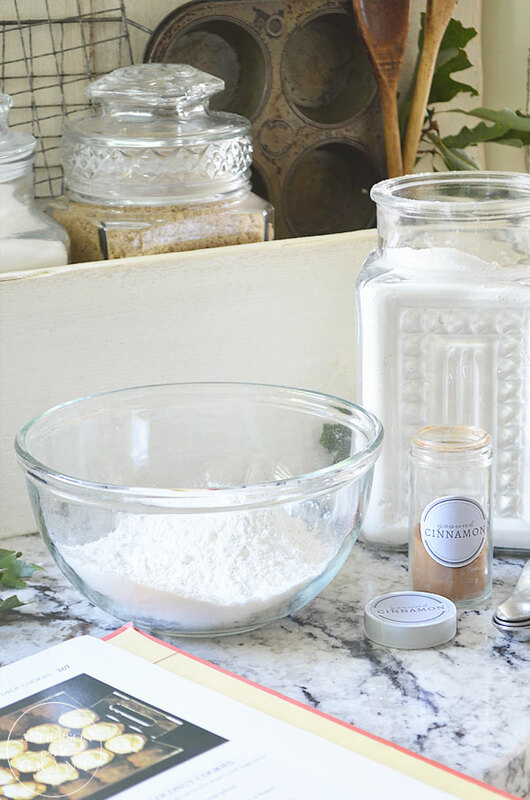 It has been turned into a baking station so that all my necessary fall baking supplies are close by. The beginning of the week was a little cooler and inspired me to whip up some pumpkin cookies! 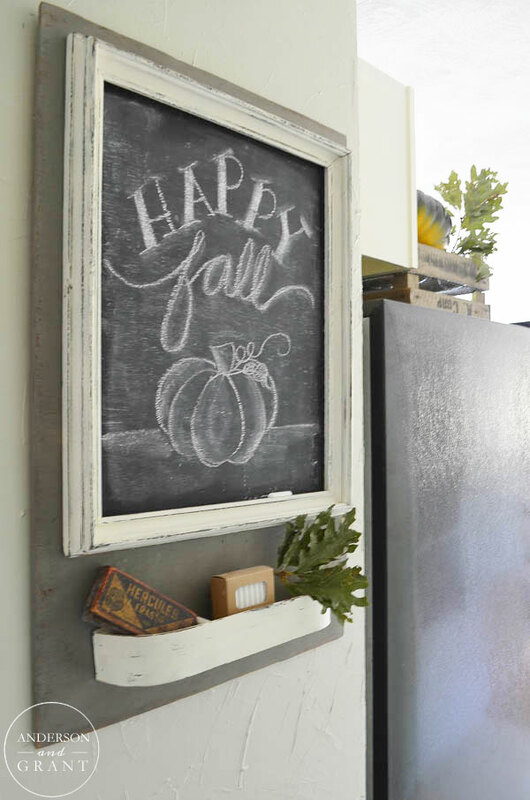 In the hallway, even my chalkboard message center has been dressed for fall!. 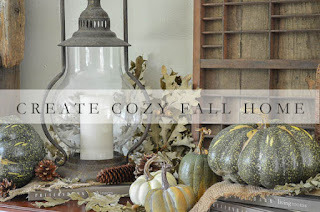 Many of you may have already seen my mantel in a post for Craftberry Bush. 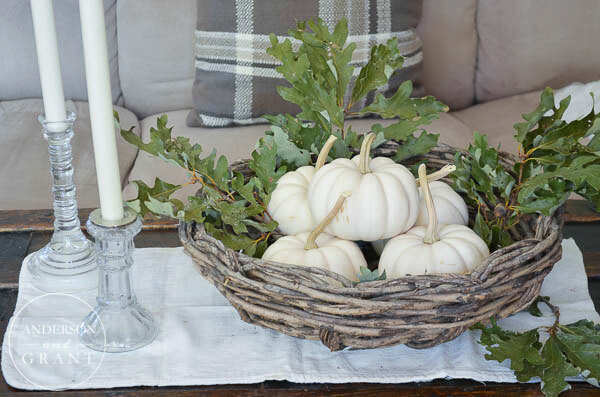 It has some faux pumpkins and more dried oak leaves. 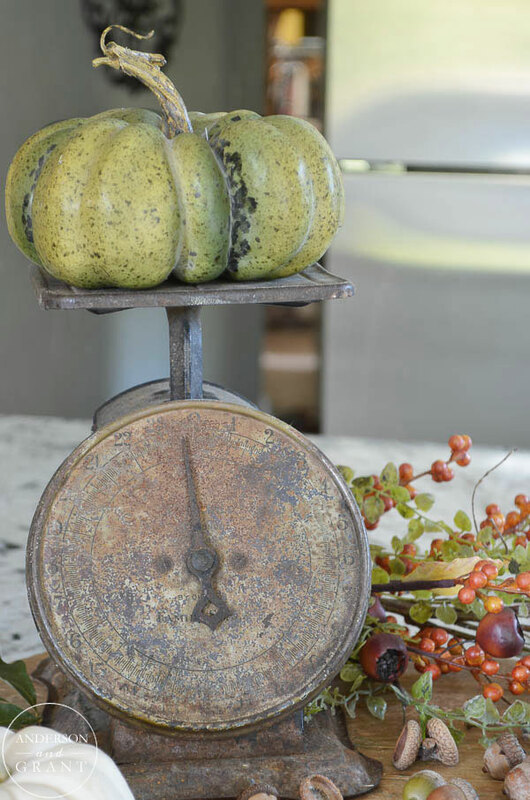 It was created before my trip to the farm market for fresh decor. 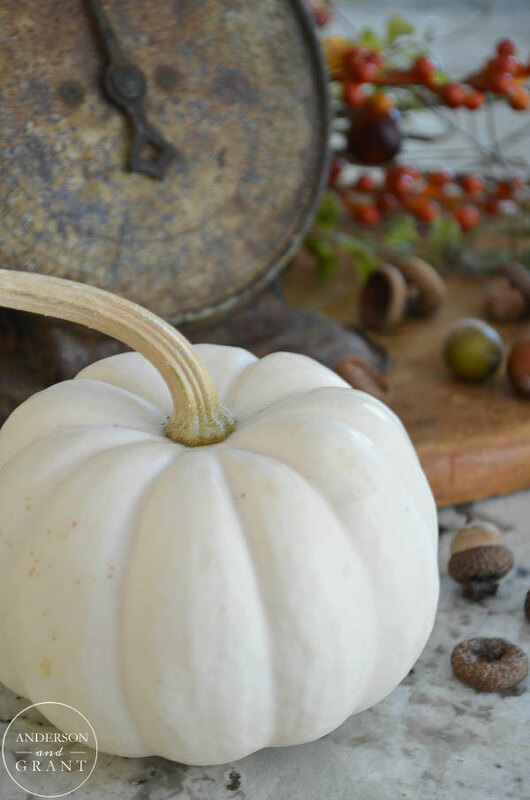 You don't have to spend a lot of money to buy real pumpkins each year. 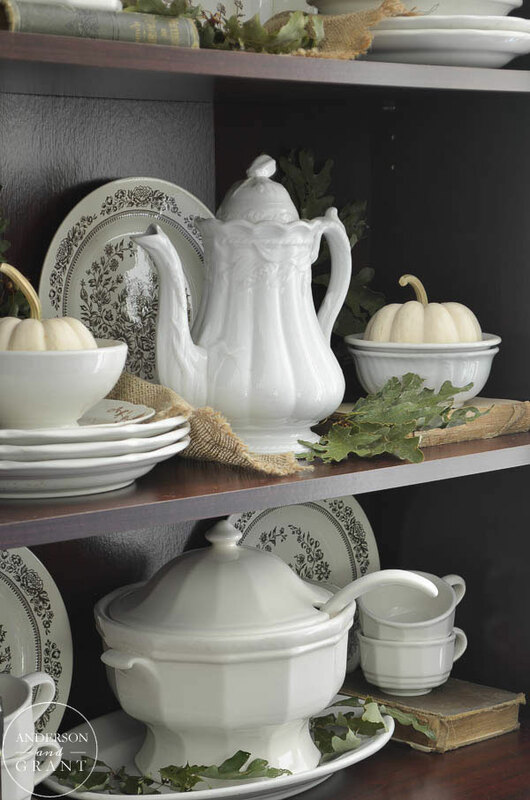 These ones were picked up at the end of the season last year for 90% off! 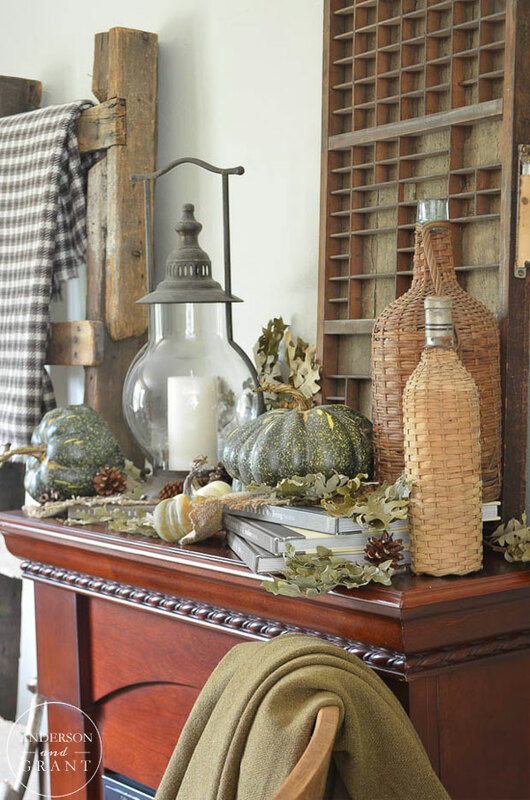 I tried to incorporate lots of layers and interesting objects in addition to a few fall things. 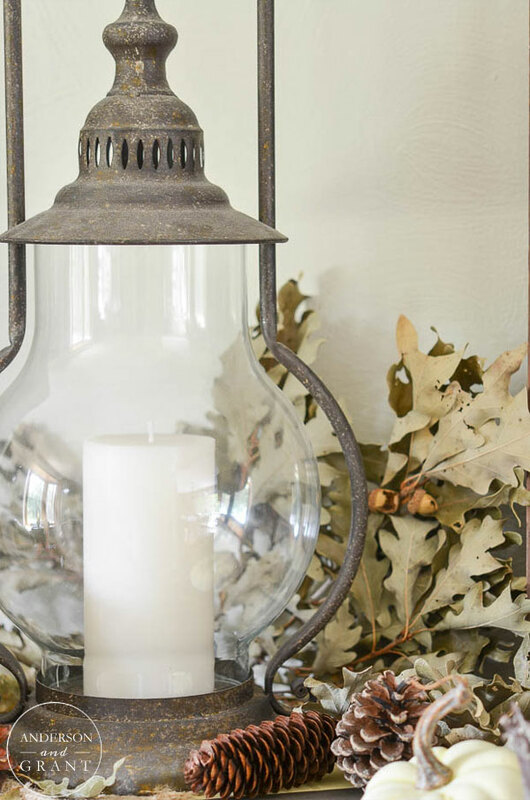 My favorite thing to use anywhere I'm decorating is this rustic metal lantern. 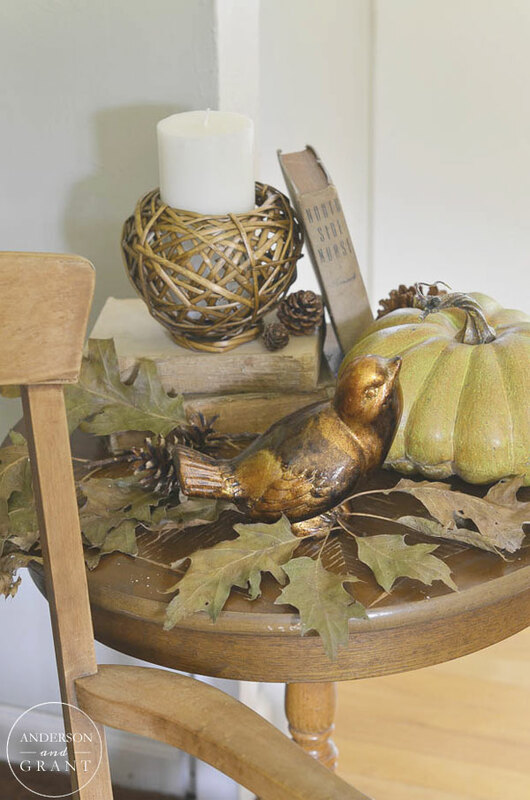 Beside the rocking chair is a little table with a pretty copper bird and candle. 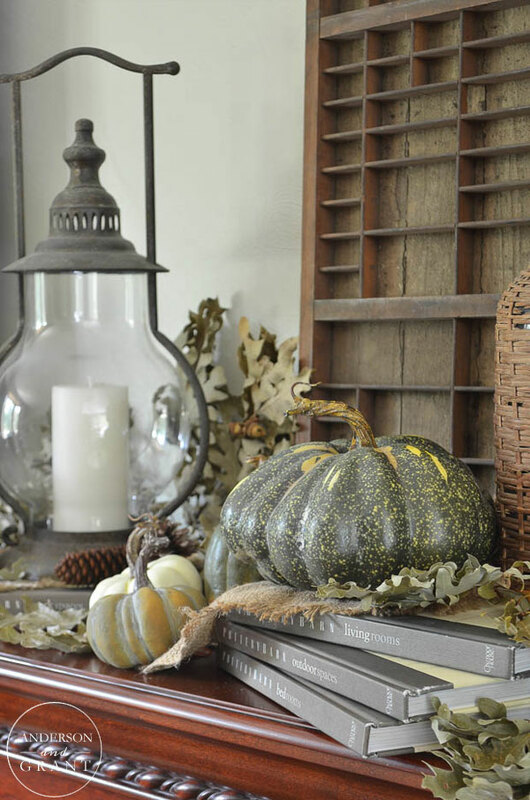 I love to have a candle burning throughout the fall. The flickering flame and glowing light makes me happy! 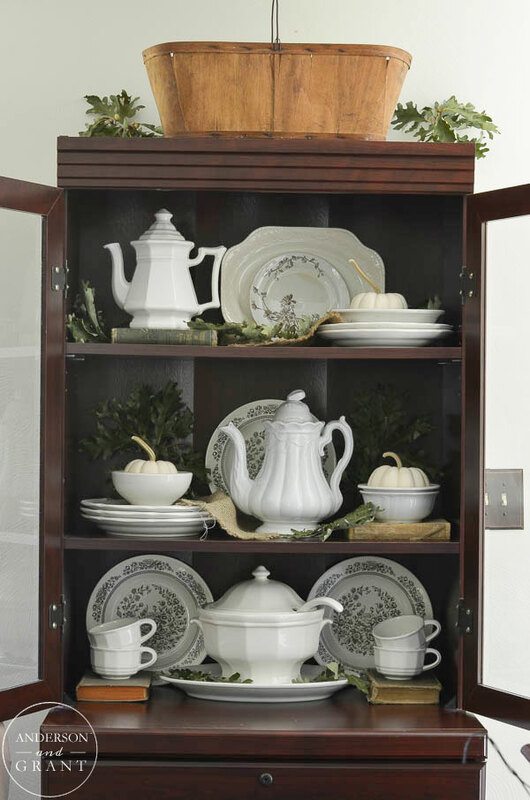 My favorite decorated area this year is a cupboard filled with my collection of white ironstone and pottery. Aside from the soup tureen which was given to me and the large teapot, everything else has been purchased from yard sales and Goodwill. 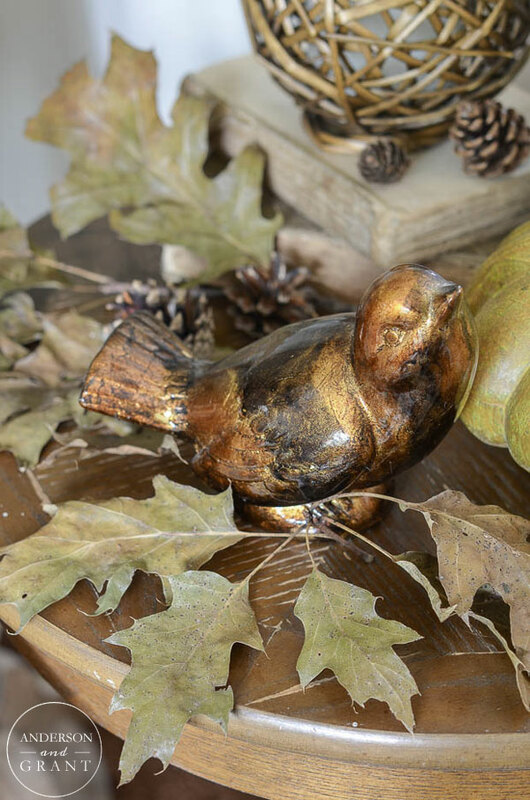 You can find some pretty pieces very inexpensively if you look hard enough! 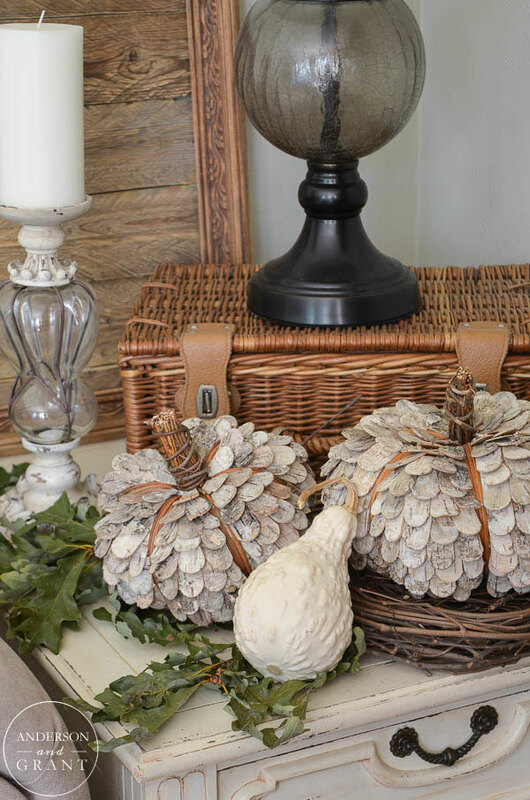 I've simply dressed it up with a little burlap for texture and more pumpkins and leaves. I'll be sharing some more details about this space next week. 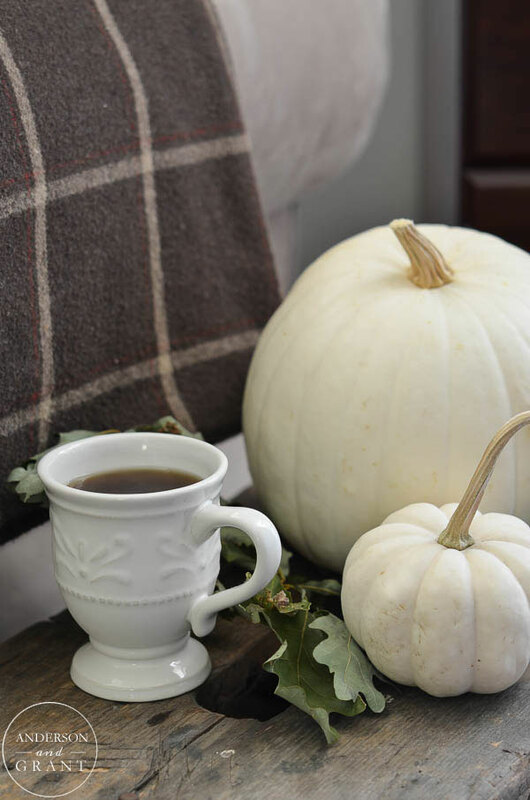 A rustic carpenter's bench that I picked up last year is being used as a little side table to hold a warm cup of coffee....or pumpkin latte! 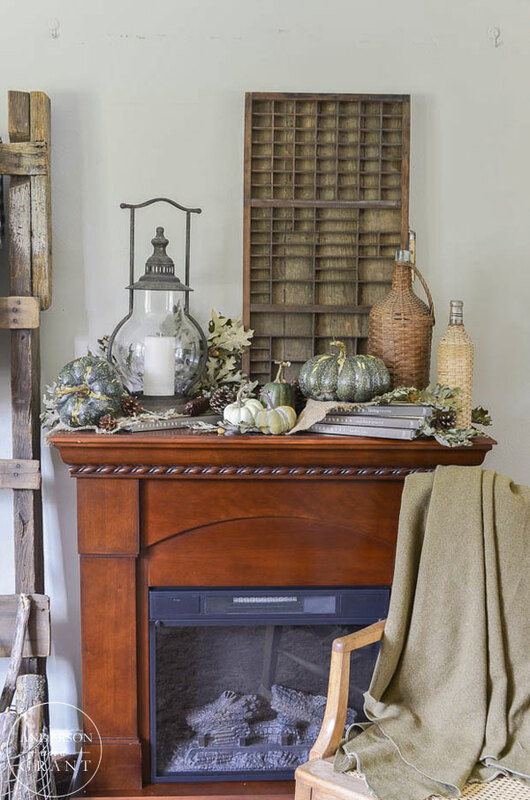 It is nice to always have somewhere to place something, even if it isn't a traditional side table. 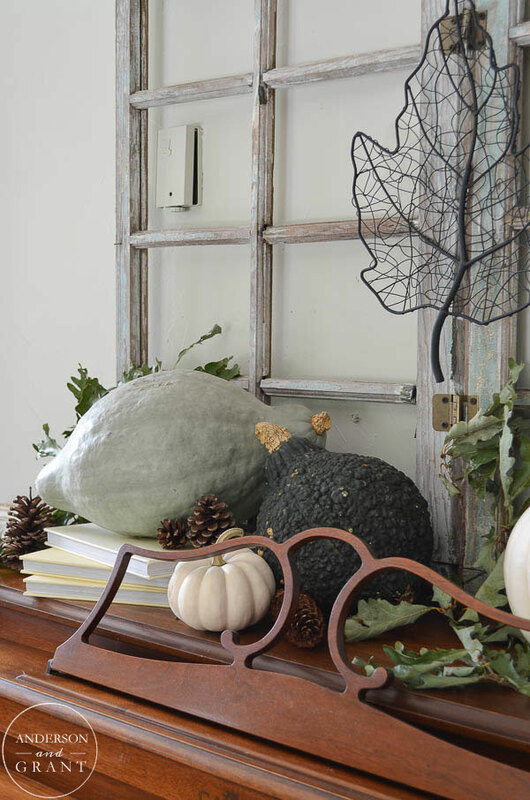 And in the corner of the room is my Target pumpkins. 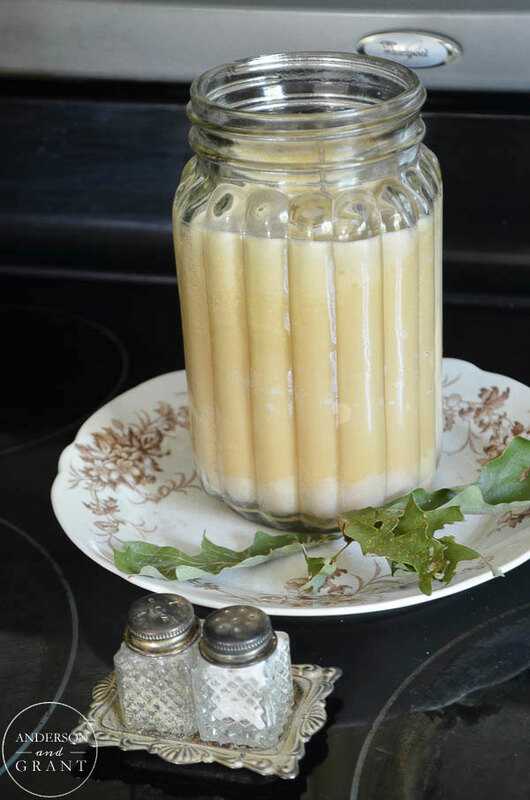 Have you seen these in the store? They were something that I knew I'd have to have when I saw them especially since they fit in perfectly with this year's theme. Behind everything I've added a tray I made last year. I think it completes the display by filling in a bit of the wall space. 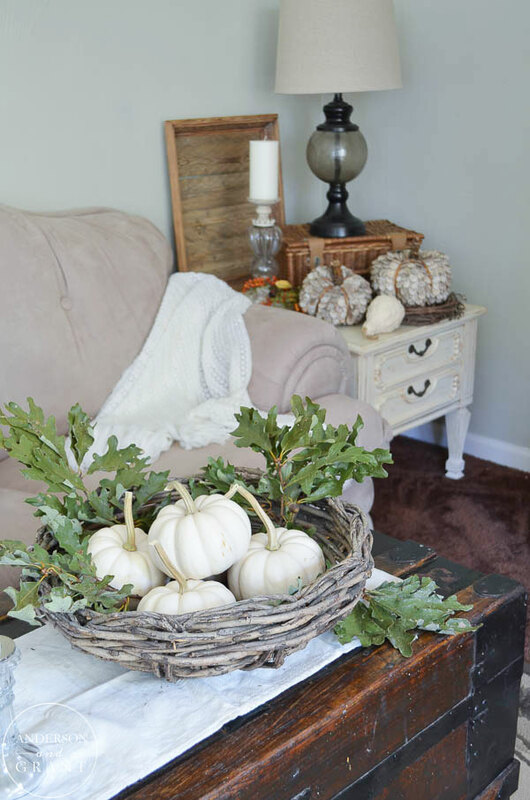 I've got some more projects in the works and lots of plans of things I'd like to accomplish this fall, so you'll be seeing these spaces again over the next month or so with different decor. For some reason, I like to constantly switch things up and rearrange. I'm a person of change, I guess. 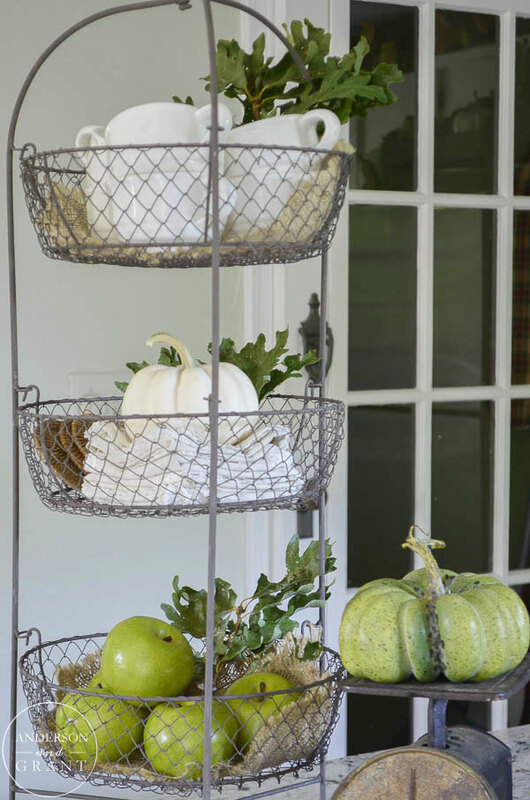 I hope you enjoyed seeing this tour of my fall home. Be sure to visit some of my other friends houses using the links below. 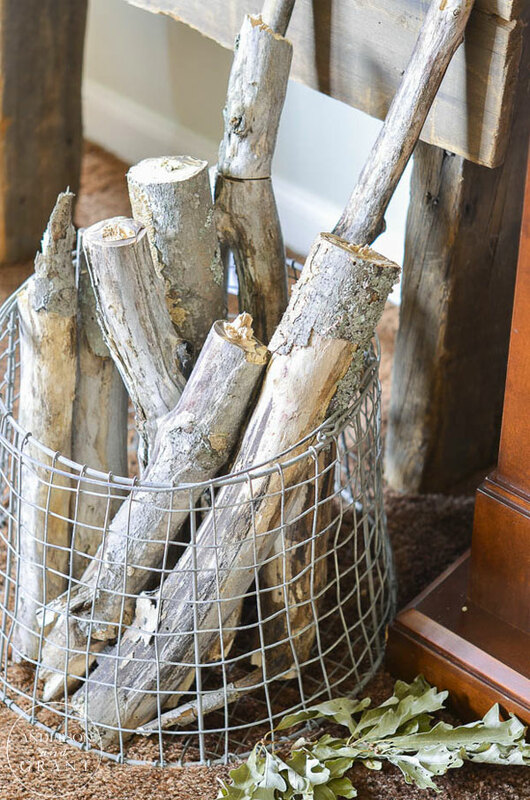 Which blogger's home is your favorite? Let me know in the comments below or on Facebook and Instagram. Have a lovely day! 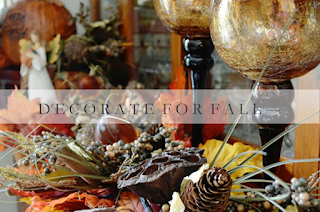 Click here to see all of my past posts on fall.